As you can see in our article “10 Fun Facts About Termites”, termites can cause a lot of damage. They can cause up to 5 billion dollars worth of damage each year to American homes. Damage to your home’s foundation can tally up quickly if you don’t keep a watchful eye. 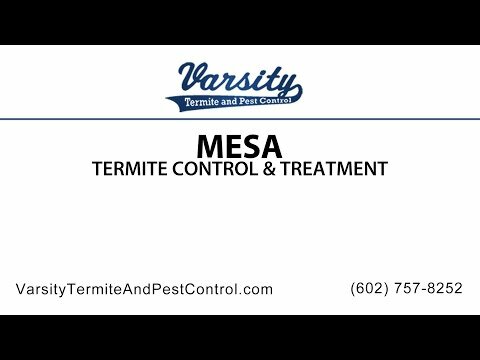 Fortunately, the Mesa and Phoenix areas have the premium service of Varsity Termite and Pest Control with more than 21 years of experience. They been able to satisfy a large number of Arizona families and continue doing so. Moving away from the Varsity Termite and Pest Control service areas and not knowing who to call in case of a pest emergency could be of concern for you. Do not worry, we know that finding good services can sometimes be a very difficult task, even more so if you are new to the neighborhood. Since we do not like to see people worried about houses full of termites, we will recommend some good termite companies in the northern and southern part of Arizona. Conn Pest Control, specializes in a wide range of termite control services for residential, commercial, and estate clients in Flagstaff for over 40 years. Their technicians are state certified in multiple areas with certifications that provide a knowledge base in numerous pest control and extermination services. It is a good service and available 24 hours a day for emergency calls! They service a lot of areas like: Flagstaff, Williams, Parks, Bellemont, Munds Park, Kachina Village, Mountainaire, Winslow, Mormon Lake, Happy Jack, Stoneman Lake, Window Rock, Kayenta, Tuba City, Fredonia, Marble Canyon, most of the Navajo and Hopi Reservations, Grand Canyon, Cameron, Page, and some places of Southern Utah. You can follow this Flagstaff termite company on Facebook. Another good option in the Arizona area is Coconino Pest Control, a contractor in the Landscaping Services industry. Since 1988 they have provided complete pest control services for prevention and eradication of termites, spiders, crawling insects, household ants and general rodents. Their service areas are Flagstaff, Bellemont, Parks, Williams and Munds Park. They are available from Monday to Friday, but if you have an emergency on a weekend, you can count on them. The Termite Assassin LLC: Richard Near, known as “the termite assassin” was born in Tucson and he says that there are only two kinds of houses in the southern of Arizona the ones that have termites and the ones that are going to have termites. He could be right. This Tucson termite company promises to arm homeowners with the information they need to protect their home, always offering fair pricing and never waiver in their commitment to exemplary customer service. They offer termite inspection services, control and treatment. Richard Near serves Tucson, Marana, Green Valley, Catalina, Sells, Mount Lemmon, Topawa, Lukeville, Amado. Gecko Pest Management Inc. could do an excellent termite treatment, control and inspection in the southern part of Arizona too. They are offering their pest control services in the Tucson area that includes termites, pack rats, mosquitoes, bed bugs, bees, spiders and more. Serving for over 17 years and now A+ Rating with the BBB since 2004 and Angie’s List 2015 Super Service Award! A very good option for termite warfare! Days of operation from Monday to Saturday. If you are going to stay in Mesa or Phoenix, remember that we at Varsity Termite and Pest Control are ready to attend you with a high quality service, all performed by licensed technicians that are trained in the latest and very best service methods. Our Phoenix termite inspections are free. Our business has been built on awesome referrals from our satisfied customers who know that we provide honest and reliable pest control in Mesa. So, don’t hesitate to call us with any questions you have about our pest and termites services.